Don’t you just love when you have an idea for a project and it actually comes out like you pictured it? Maybe even better?? 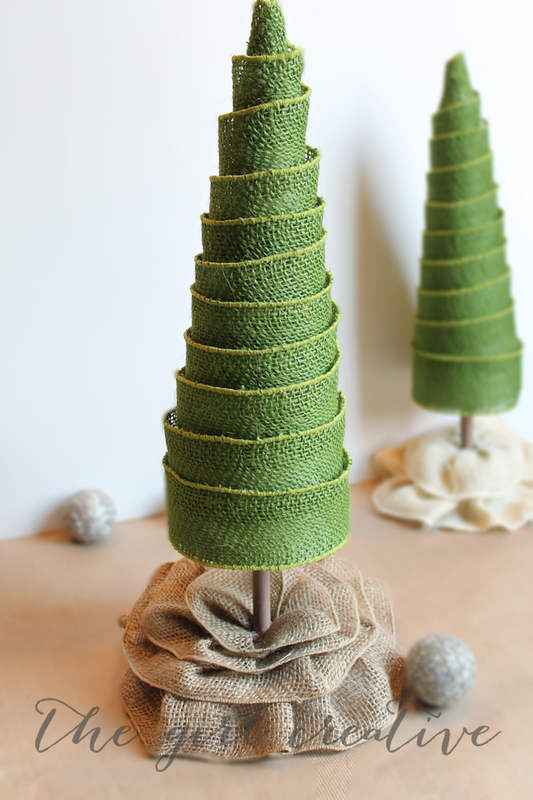 That just happened to me with these Burlap Ribbon Trees I made as part of the “Foam for the Holidays” campaign with Make It: Fun® Foam and Design It: ®Simple. 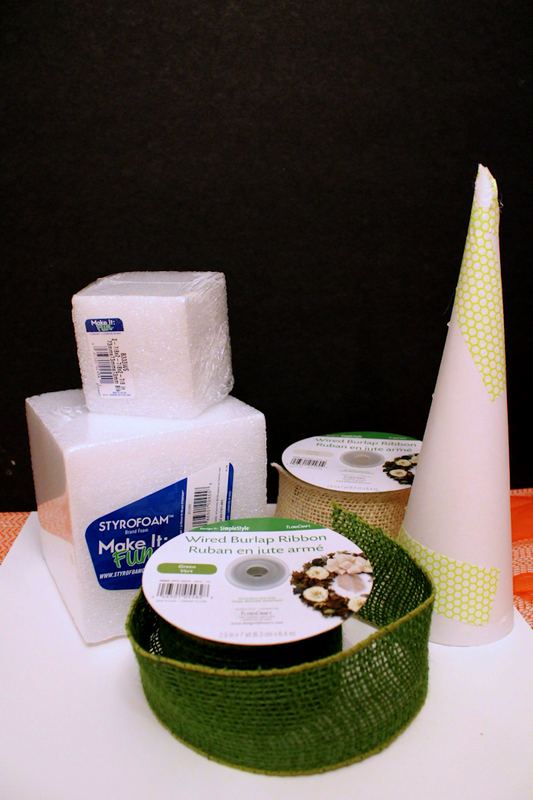 The details of this campaign were simple: I would receive a box of foam in various sizes from Flora Craft as well as a mystery add-on item and I had to come up with a project. Simple enough, right? I was hoping for those foam cones, wreaths or even balls you see in craft stores because that would be an easy challenge. I could do a wreath, a topiary or a tree. Ummm, not so much. My box contained various styrofoam squares and a few rolls of wired burlap ribbon. My initial thought was, “oh I could wrap the blocks in the ribbon and BOOM I’d have some cute faux Christmas presents”. No wait. My FIRST thought was “What on earth am I going to do with this?? ?” Then the whole idea of making my own tree even though I didn’t get any foam cones came to me and I couldn’t wait to get started. I used the foam squares as the base of the tree. I initially used an entire block (the smallest one I received) as the base of the tree but didn’t like how it looked after I made the ruffled tree skirt from the burlap ribbon. I cut it down so that I was now working with a foam slab that was about an inch or so thick. I was worried that the weight of the tree (it’s not heavy at all but I just wasn’t sure how that would work out) would not be supported by the slab but it worked fine. Score! I don’t have a ton of progress photos. A girl with a toddler needs to craft, and craft quick when she gets the chance so I didn’t stop to take a lot of photos. Plus I really was expecting the whole project to be a bust (because most of my good ideas turn out to be craft fails) so when it actually turned out, I was left without pictures. Figures! Since I didn’t have the foam cones, I made my own out of poster board. I followed a tutorial on You Tube and it was very simple. Of course now I can’t find it to provide you with a link but if you Google “how to make a cone out of poster board” a bunch of tutorials will come up. Or, you can just get a foam cone from your local craft store. Once you have your cone made take your craft paint and paint your dowels brown for the tree trunk. Once the paint has dried, hot glue the dowel to the inside of the tree. If you find that your dowels are not long enough (I had this problem) you can just stuff tissue paper inside the cone and play around with it until it looks right to you. Next you will want to cut your foam block down so that you wind up with a slab that is about 1 inch thick as the base of your tree. 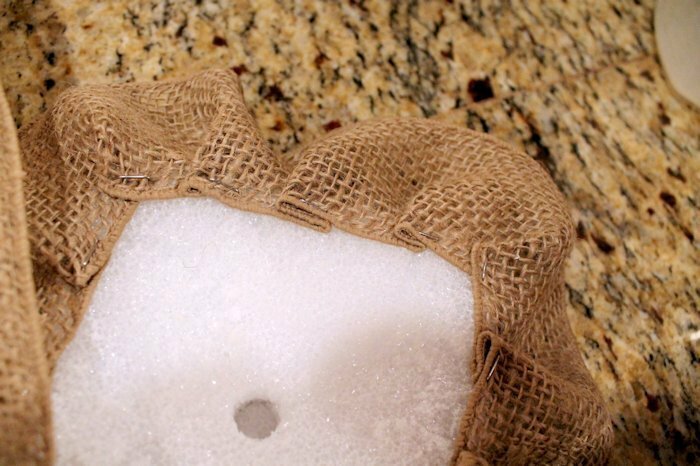 Use your dowel and make a hole in your foam base right in the center. 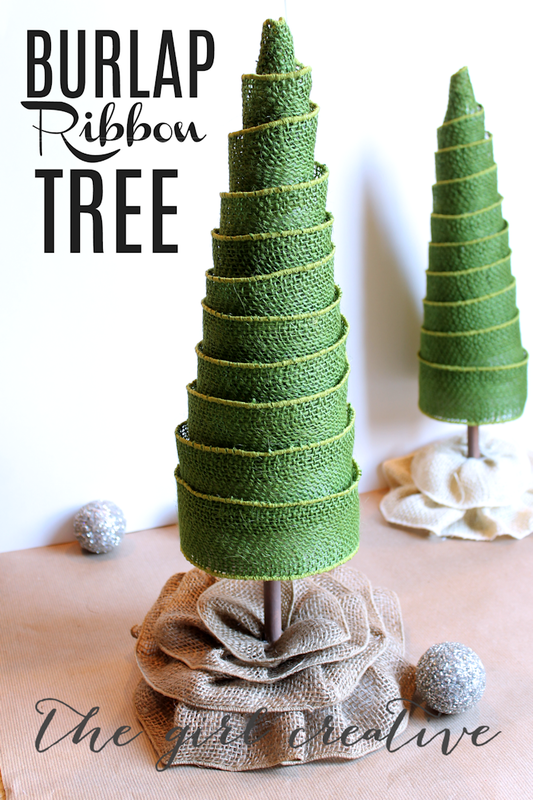 Now that you have your base, it’s time to make the ruffled tree skirt. 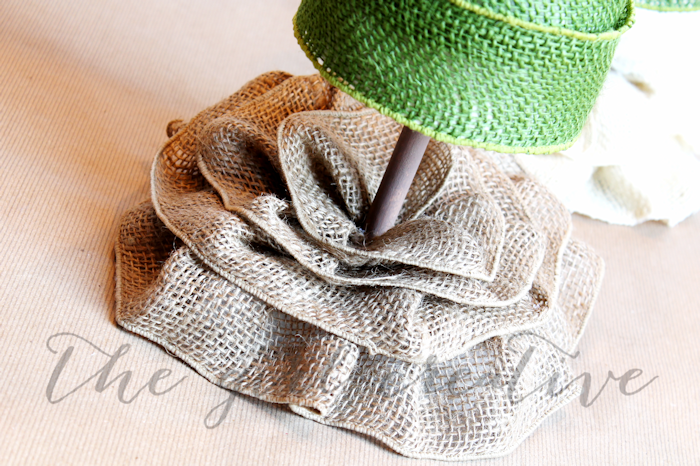 I pinned the end of the burlap ribbon to the outside of the foam base. I then created ruffles by overlapping the ribbon a bit each time as I went around the base. I pinned in place and just kept going around until I reached the center of the base and only the hole is showing. This is what it should look like when you are done. 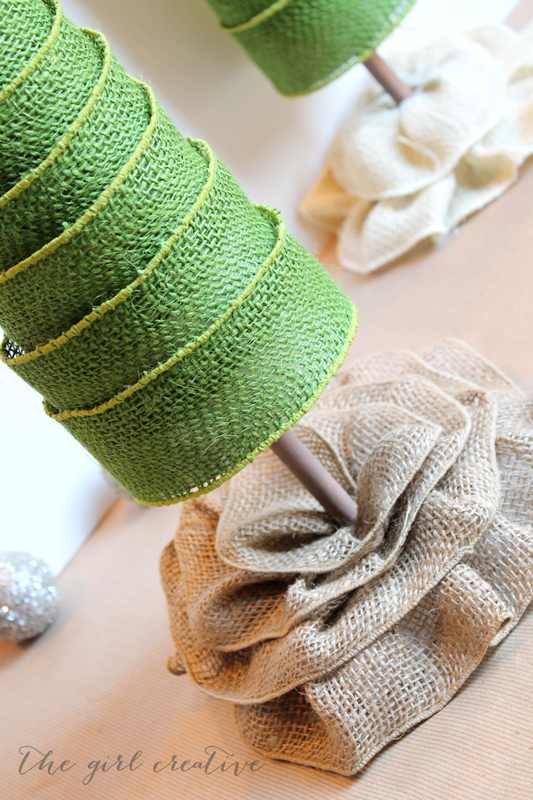 Now that you have your base and ruffled tree skirt done, you are ready to finish up the tree. 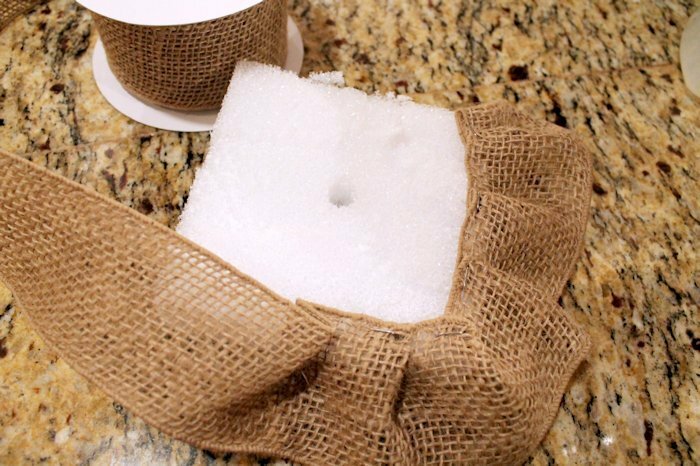 Take the end of your green wired burlap ribbon and hot glue it to the top of your cone. Slowly wrap your ribbon around the cone very loosely by twisting and twisting the tree. The great thing about the wired ribbon is that it holds it’s shape as you wrap it around the cone. Once you get to the end just hot glue end of the ribbon to the tree. You will want to add some hot glue here and there on the inside layers of the ribbon so that it stays in place since it’s wrapped rather loosely. 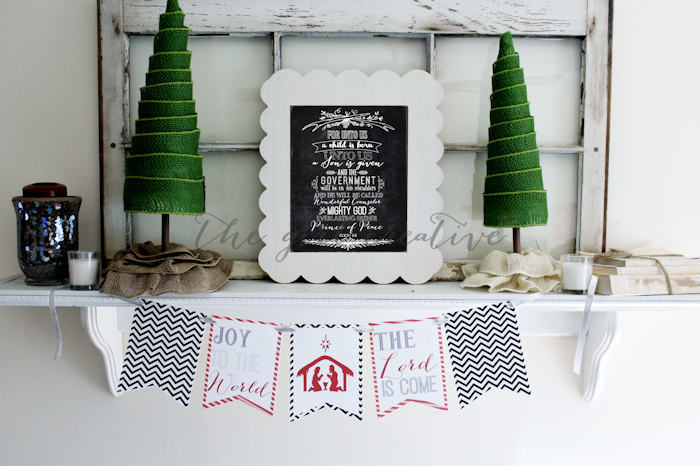 I have my trees up on my mantel and but they would look super cute just about anywhere in your house. I chose a high place because my little guy has wandering hands (we call him “Fingers” because nothing is safe when he’s on the loose. lol) and I wanted to keep them to survive the holiday. Ha! Disclosure: I received the materials and compensation for this project from Make It Fun® but the opinions are entirely my own. I work at Michaels and always love finding cute crafting ideas I can suggest to our customers. And I will definitely send folks your way...thanks for making my job a little easier. Super cute Diana!! I especially love your little tree skirts! Thank you, Jenn!!! That's my favorite part too! These little ribbon trees are so precious! I love that they are simple and classic looking. I also love how you did your mantel. Thanks for sharing with us! I love love LOVE these!! They are so cute!! Pinning! Your trees are beautiful! The ruffled bases are so pretty. Pinned! Thank you for the tutorial. These are adorable. I was just looking at a bunch of old craft supplies and I think I have everything I need to do this with a few substitutions. Thanks for the fantastic idea!!! Wow. That's really cool. I'm obsessed with Christmas and crafts, so I tend to stumble across a lot of cool crafts. This is hands down one of the more ingenious! How long do you think it took you to do? Thanks for letting me know. I'll have to see if I find the time. Still have Christmas shopping to do and kids to care for, but I keep stumbling upon all of these brilliant ideas! Question: For the dowels, are they long or short? Since you used paper for the cones, how did you get the dowel to stay in the middle of the "tree"?